Jamaica with its capital Kingston is located in North America (Caribbean, island in the Caribbean Sea). It covers some 10,992 square kilometers (about half the size of New Jersey) with 2,990,560 citizens. English is the language commonly spoken used in Jamaica. This country shares no land borders with another country. Jamaica is an island nation in the Caribbean, located to the south of Cuba and to the west of the island of Hispaniola. The climate in Jamaica is tropical, with hot and humid weather, although higher inland regions are more temperate. Some regions on the south coast are relatively dry rain-shadow areas. Jamaica lies in the hurricane belt of the Atlantic Ocean; as a result, the island sometimes experiences significant storm damage. Visit Nine Mile where Bob Marley was born and now buried. The journey up into the mountains lets you experience the heart of the country. The landscape is mostly mountains, with narrow, discontinuous coastal plain. The average density of population is about 272 per km². The climate in Jamaica can be described as tropicalhot, humid, temperate interior. Potential threats by nature are hurricanes (especially July to November). To reach someone Jamaica dial +1-876 prior to a number. The local cellular networks are operated on 900 MHz, 1800 MHz, 1900 MHz, 3G, 4G. Websites typically end with the top level domain ".jm". If you want to bring electric appliances (e.g. battery chaarger), keep in min the local 110 V - 50 Hz (plugs: A, B). The sign for the locally used currency Dollar is JMD. 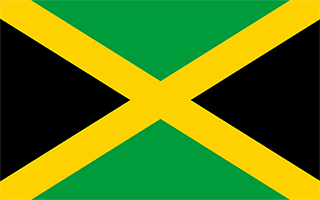 Diagonal yellow cross divides the flag into four triangles - green (top and bottom) and black (hoist side and fly side); green represents hope, vegetation, and agriculture, black reflects hardships overcome and to be faced, and yellow recalls golden sunshine and the island's natural resources.